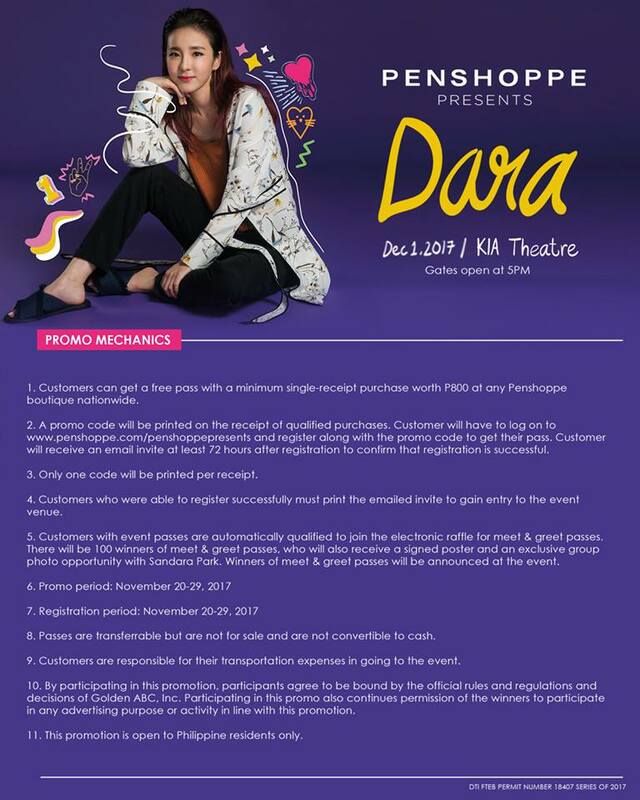 How can I get a free pass for #PenshoppePresentsDara? You can get a free pass by purchasing a minimum single-receipt purchase worth P800 at any Penshoppe boutique nationwide! A promo code will be printed at the receipt. What if there was no promo code printed on the receipt? Take a photo of your whole receipt. Make sure it reflects your purchase worth at least P800! Dates on the receipt should fall within the promo period: November 20 (12nn) to November 29. Send the photo to Penshoppe via FB Messenger, Instagram DM, or Twitter DM. Wait for Penshoppe’s reply regarding your promo code. Where do I log in the promo code? Register your promo code, along with other details, at http://penshoppe.com/penshoppeprese…! Should I print the email confirmation sent to me? Will screenshots be okay? What if I don’t get an email but I’ve successfully registered? Yes! Anyone with a printed e-ticket will be guaranteed a seat. No, seats are available on a first come first serve basis. What time can the fans enter? How can I get an exclusive photo opportunity with Sandara Park? Once you have event passes, you are automatically included in the electronic raffle. 100 lucky winners will be announced during the event! Until when can I purchase and register to get free passes? Promo and registration period is until November 29, 2017 only.